Feedback from two public forums drove the latest Graduate Assistant Policies and Procedures (GAPP) Committee meeting, resulting in a move toward greater transparency and accountability on the part of the university administration. The two forums, held in late October, attracted graduate students, department administrators, and others from across campus. The meetings provided an overview on the GAPP process, and sought to provide details on the new graduate assistant handbook and solicit feedback and questions from attendees. 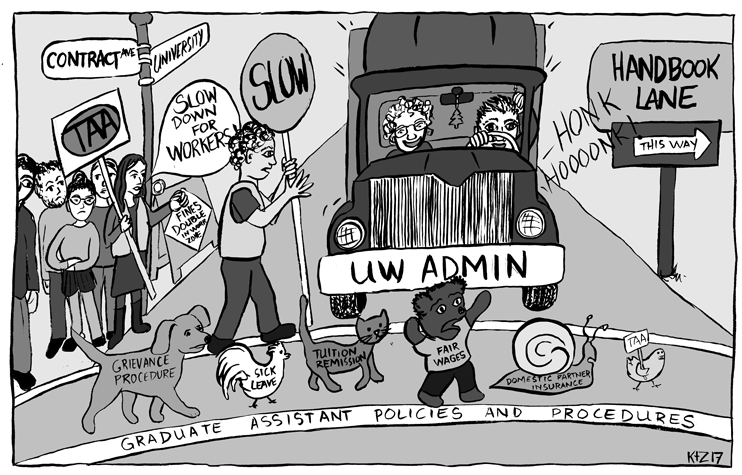 At times contentious, the questions, comments, and feedback that graduate students and graduate assistants had for administration underscored the different opinions that graduate student workers and HR have with respect to the sections of the contract discussed so far. In response to the forums, the administration opened the latest GAPP meeting by proposing categories (i.e., ‘consensus,’ ‘further collaboration/subject matter expertise,’ ‘opposing or incongruent positions,’ and later ‘not discussed’) to evaluate where committee members stand and improve transparency. The administration also proposed the categorization of the sections of the contract covered in previous GAPP meetings. The greater transparency and accountability addresses a significant complaint on the part of graduate student workers and TAA members, and these proposals signify a greater commitment on the part of the administration to addressing graduate student feedback. However, while the administration understands graduate student concerns, there are currently no action items to address issues such as state health care cuts, and questions remain regarding the continuation of the GAPP process. The committee agreed to extend its meetings through the end of the semester, although there is no commitment from the administration on what the process will be if consensus is not reached by December 11. The next meeting will be held November 20, and will focus on wages and benefits, and potential action the university can take to ease hardships brought on by state changes in health care. These meetings are open to the public. Additionally, please fill out the GAPP Forum survey if you haven’t already, and make sure your colleagues complete it as well.